Swagatika Patel did 5 year integrated law course in 2010, from Symbiosis Society’s Law College, Pune to pursue a career in corporate law. After spending 4 years in job, she had a realization and decided to take a break. What followed is the result of her passion and the will to help people connect by understanding their problems. 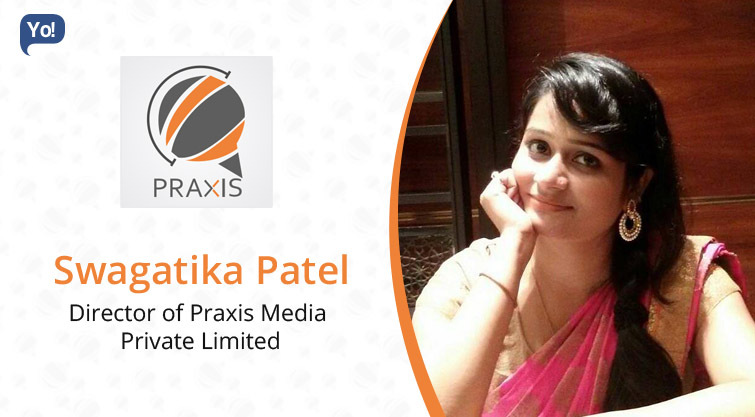 Swagatika started Praxis Media Private Limited in 2015, which help businesses through its brand management, business advisory, market research, strategic public relations, media management, reputation management, design and communication services. Her aim is to gradually grow Praxis Media by offering affordable and turn-key marketing services. Praxis Media Private Limited is an insight driven media and marketing services company that helps in boosting businesses and services by taking them to their zenith through accreditations, brand management, business advisory, market research, marketing solutions, strategic public relations, media management, reputation management, design and communication solutions. We are a one-stop solution for affordable and turn-key marketing services. After two job switches I took a break in 2014. One year of self-reassessment, I decided to leave – law and follow my dreams of connecting with people and serving them. Meeting people, understanding their needs and helping them has always been a passion. Whether as a lawyer or entrepreneur that’s what I am doing. I believe that whatever happens, it is for a reason and that reason is always good. There was the risk of leaving a lucrative job for starting my own venture that also with no experience or know-how. Also, there were lots of apprehensions and difficulties after post-incorporation of the Company. Thankfully, being a lawyer I was aware of the formalities involving incorporation of a private limited company. However, there were lots of unanswered questions about how to get employees, initial financial hiccups, where to get clients and more. But, internet has made a lot of things easier. We were able to hire with the help of various job portals and connect with clients through social media platforms. Praxis Media is a self financed company. I am used to working in set timelines and find it very useful. I would like to become a morning person and finish my day early. Do not hesitate in taking risks. If you win you will be happy and if you lose, you will be wise. Keeping ideas to oneself and following the trend. To treat your employees as your equal. Would like to gradually grow Praxis Media. I love being an entrepreneur and corporate lawyer.